MAPLE RIDGE, B.C. 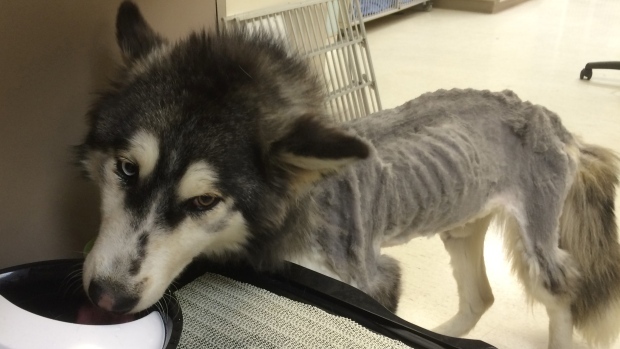 - The owner of an emaciated husky in Maple Ridge, B.C., that ate gravel to try to stay alive faces two charges of animal cruelty. The charges were laid Monday following an investigation by the BC SPCA. The agency says the dog, named 'Willow," was found wandering alone in January 2015 and weighed just 15 kilograms compared to a normal weight of about 24 kilograms for a dog of that age and breed. Lorie Chortyk, general manager of community relations for the BC SPCA, says when found, the husky had difficulty walking and couldn't lie down due to abdominal pain. She says there were no food remnants in her stomach "so it's likely that she had been eating gravel to try to stay alive." The dog was treated at a local animal hospital and cared for in an SPCA foster home for several months before being adopted last March. Yu Lin, a university student in his 20s, faces up to two years in jail and a maximum fine of $75,000 if convicted.